The most intractable problems demand the most creative solutions. 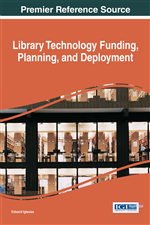 This chapter describes the process of funding a presentation machine designed to improve engagement at library events such as health fairs. It details the considerations that went into budgeting, funding and designing the hardware itself as well as the original game that ran on the machine. The chapter includes recommended points of particular attention for the reader, with the aim of assisting other information professionals in successfully pursuing similar projects. The most intractable problems demand the most creative solutions. This was the axiom that the author of this chapter decided to apply to a problem that first confronted the librarians of the University of New Mexico's Health Sciences Library and Informatics Center when he was on faculty there. The problem became apparent as the author participated in the library's outreach efforts . . . part of the distribution of the duties of our former outreach librarian. It became apparent that when the library went to many outreach events, such as health fairs, there was a common thread. While the library booth would get a few visitors who took some pamphlets or, on rare occasions, requested a search, the vast majority of visitors made it their habit to frequent other types of table. Presenters offering free tests of various kinds, or who demonstrated interesting and expensive medical gear were among the most popular. If medical libraries were to compete, they needed a hook. The first 'hook' the author attempted was a slideshow designed to be showcased on a laptop or a convertible computer. The slideshow took advantage of the National Library of Medicine's extraordinary collection of remarkable images, which made for a visually stunning display. Coupled with a series of simple transition effects, the slideshow was a hit with librarians, and it attracted attention. However, unlike the successful hooks the author had seen from other health fair presenters, it was not interactive. It could attract some attention, but the depth of that attention was inherently limited.